For years I passed over the plates at the front Asher Benjamin's books. At the time, I only wanted to see his buildings, and had no idea why he included plates on geometry and molding profiles. 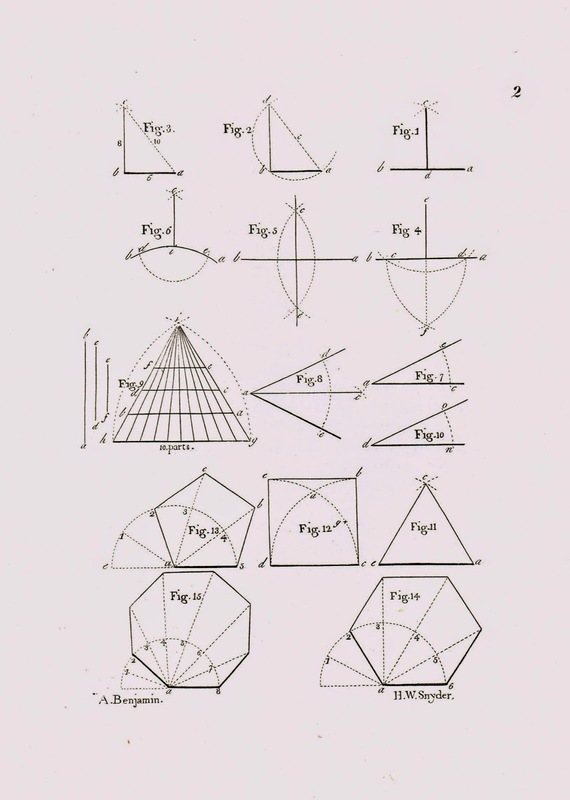 The first 5 plates in The American Builder's Companion are instructions on basic geometry because many of his readers were "untaught." Many young men left apprenticeships to seek their fortunes, move west.They still needed to build. Benjamin provided their geometry course. A point is that which has position, but no magnitude nor dimension; neither length, breadth, nor thickness. Here is Plate 2, the one we might recognize as useful in design. The Figures 3, 4, and 5 describe how to layout perpendicular lines, Figure 12 scribes a square. By Plate 4 , Figure 3, he is describing "How to find the raking moldings for a pediment" - a semester of academic learning in 6 pages! It's not just Asher Benjamin who cares about teaching geometry. Peter Nicholson's The Carpenter's New Guide, which ran 13 editions in Britain and the States from 1792 to 1857, spends 126 pages describing what he calls Practical Geometry. He begins with "1. A Point has position but not magnitude." (He's less flowery than Benjamin). Neither of these pattern-book authors wanted their ideas to only be copied - they wanted their readers to possess the intellectual tools to adapt these designs to their own situations.